Hot on the heels of plundering their hop stockpile for the multi-venue, simultaneously tapped, "fresh is best", CCC double IPA, the crew at Modus Operandi is balancing out the ledger with a spritely session IPA. And it’s something of a diametrically adjusted ale, seeing as it’s more of a summer style beer but one that’s been prepped for winter. 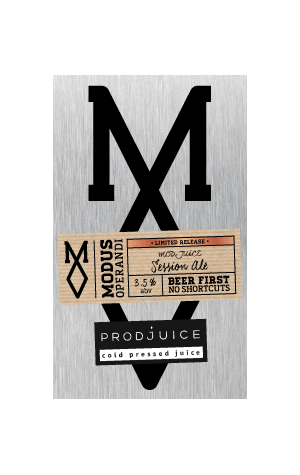 You see, during flu season everyone is reaching for the vitamin C in the hope that it will help stave off the ill effects of the virus (although too often only after they’ve caught the lurgy) so Modus’ session ale was topped up at the end of its fermentation with a cold pressed organic juice blend from their friends at the spellchecker-troubling Warriewood’s Prodjuice. Prior to that it had gone through a more traditional brewing method, which included loading it with Citra hops. Despite happening to coincide with Sydney’s coldest snap of the year, this is a light winter beer that even the health conscious should be able to get behind.